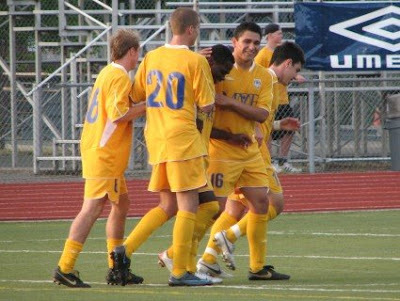 It wasn't pretty, and it wasn't a full match's worth of effort by any stretch, but Tacoma Tide did manage enough energy over about 20 minutes at the start of the second half to pull out a 3-1 victory over the visiting Spokane Spiders June 20th at Curtis High School. Tacome Tide FC have now gone 17 straight matches (including 15 league matches and two friendlies) without a defeat at home dating back to 2006. It was 0-0 at halftime with Tacoma committing numerous turnovers in the midfield and not clicking up front. Spencer Schomaker was out with a hip pull, and will also miss Saturday's match in Salem against Cascade Surge. The Tide were also without head coach Fran O'Brien and GM Mike Jennings. Whatever the reason, TFC came out apathetic and unorganized. Beau Macaluso barely misses a first-half header. 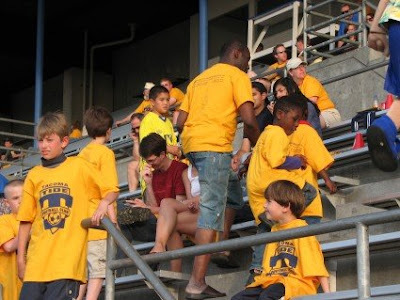 Fans got free yellow Tide shirts. 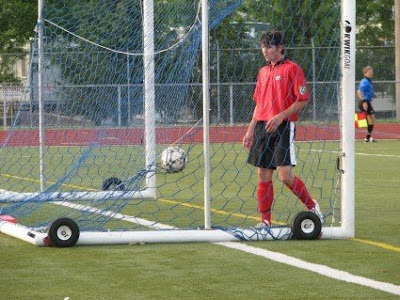 TFC's second goal is stuck in the net. Tide celebrate Machael David's match-winner. Rory Agu brought the yellow-clad fans to their feet seconds after the second-half kick off when he blasted down the left sideline and rocketed a shot into the left corner to put TFC up 1-0. Just a few minutes later a nifty flick in front of goal by midfielder Machael David made it 2-0. 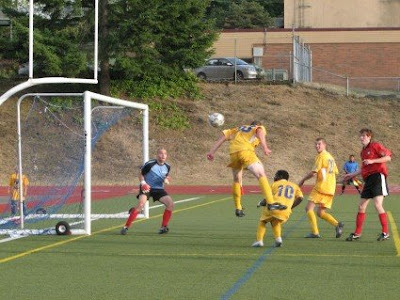 The same stretch of improved play netted Tacoma's third goal on a low-ball roller struck by Raphael Cox after a clearance that began with a much-contested free kick award. Beau Macaluso had been tripped outside the box on the right side. Spokane's keeper and coach were complaining loudly about 'the cheating diver' (looked like a hack on his leg to me). Before you know it Cox gave them something more tangible to complain about. 3-0 to the Tide. The match was a midfield muddle for much of the rest. There was drama when Tacoma surrendered their first goal in over 500 minutes of play, and even more when TFC's Taylor Mueller was red-carded late on and Spokane were awarded a penalty kick. Back-up goalkeeper Max Walker had been put in a few minutes earlier (on this his 21st birthday). Max rose to the occasion and dove perfectly to his right, outstretched enough to stop the pk shot and preserve Tacoma's 3-1 scoreline. Tacoma are now 8-2-1 on the season with 25 points and remain in first place in the PDL Northwest Division. Spokane falls to 2-8-1. The Tide travel to Salem Saturday night to play the Cascade Surge at 7:35 PM.